Today is definitely a scary day for Jaime King! 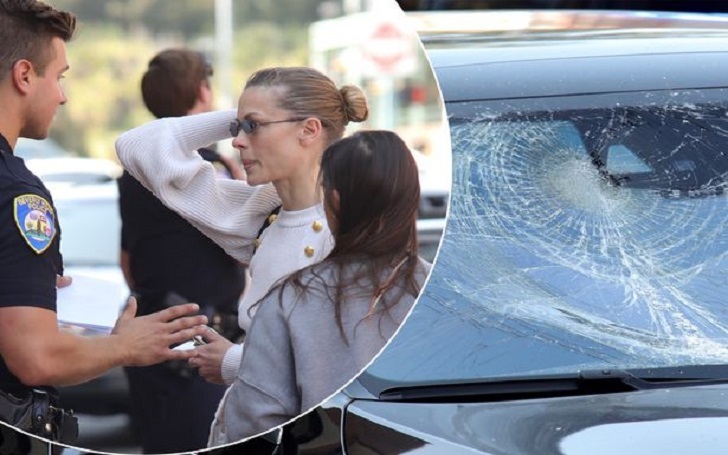 Earlier this day, a man jumped onto the 38-year-old actress' Mercedes-Benz car and smashed its windows in while her son James Knight Newman, 4, was inside the car in Beverly Hills, multiple sources have confirmed. The Beverly Hills Police Department says that the shattered glass struck the little boy who was in the car's back seat. At the time of the attack, the Hart of Dixie star, who also shares 2-year-old son Leo Thames Newman with husband Kyle Newman, reportedly was outside the vehicle. But one of Jaime's female friends was inside the car with her son and emerged from the car to protect James and was hit with a can by the attacker. The suspect - identified as 47-year-old Paul Francis Floyd - has been arrested for misdemeanor battery, felony child endangerment, and two counts of felony vandalism. Paul is being held on $100,000 bail and as per the report, he is scheduled to appear at the Airport Courthouse on 6 April 2018. On April 4, 2018, at approximately 4:43 PM, the Beverly Hills Police Department received several calls of a vehicle vandalism in the 400-block of N. Bedford Drive. Police arrived within minutes and promptly detained the suspect. The statement also states that the suspect vandalized two cars "by kicking and jumping on the vehicles."